Gunnar Stone-Eye is an elderly miner present in Helgen when Alduin attacks during the Unbound quest. He does not seemingly make it out of Helgen alive. 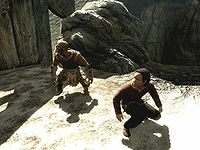 During the attack on Helgen, after your jump from the tower to the destroyed inn, Hadvar will shout at Haming, making sure he gets to safety. He will then ask Gunnar to keep an eye on him with, "Gunnar, take care of the boy. I have to find General Tullius and join the defense." 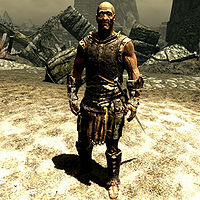 Gunnar will then stay put behind a burned down building and say, "Gods guide you, Hadvar." This is the last you will see of Gunnar, but since Haming is one of the few survivors, he obviously kept his word to Hadvar. He wields an iron sword and wears iron armor with matching boots and gauntlets. This page was last modified on 8 May 2016, at 19:58.